Artist’s concept of NASA’s New Horizons spacecraft cruising through the Pluto system. The probe will make history’s first flyby of the dwarf planet on July 14, 2015. 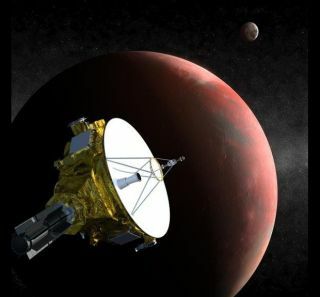 A glitch caused NASA's New Horizons spacecraft to go dark for more than an hour Saturday (July 4), just 10 days before its historic flyby of Pluto. The probe's handlers lost contact with New Horizons at 1:54 p.m. EDT (1754 GMT) Saturday but were able to restore communications at 3:15 p.m. EDT (1915 GMT). "During that time, the autonomous autopilot on board the spacecraft recognized a problem and — as it’s programmed to do in such a situation — switched from the main to the backup computer," New Horizons team members wrote in an update Saturday, stressing that the spacecraft is healthy. "The autopilot placed the spacecraft in 'safe mode,' and commanded the backup computer to reinitiate communication with Earth," they added. "New Horizons then began to transmit telemetry to help engineers diagnose the problem." Members of an "anomaly review board" are currently investigating the issue and working to get New Horizons out of the protective safe mode and back up to speed. Mission officials said the recovery process could take several days, since it takes about 4.5 hours for commands to get to the spacecraft, which is nearly 3 billion miles (4.8 billion kilometers) from Earth. "New Horizons will be temporarily unable to collect science data during that time," team members wrote. "Status updates will be issued as new information is available." The $700 million New Horizons mission launched in January 2006, tasked with performing the first-ever up-close investigation of the Pluto system. On July 14, the spacecraft will fly past the dwarf planet at a distance of just 7,800 miles (12,500 km). While the most exciting science data will be gathered at and around closest approach, New Horizons has already begun lifting the veil on Pluto. Images beamed home in the past week or so have revealed intriguing surface features on the dwarf planet, including large, evenly spaced dark patches near the equator that have scientists scratching their heads. New Horizons' recent photos have also shown that Pluto is reddish brown while its largest moon, Charon, sports a grayish hue.